It's our biggest event to date. We've got more than 40 food stalls to tickle your taste buds at the first ever Nuffnang FoodFest. We're bringing to you some of the best dishes in Malaysia and putting them all in one place! You don't have to worry about your wallet while you're stall-hopping because you won't be needing any cash. That's right, instead of money, we're introducing Social Media Currency! All the delicacies come in small (if not bite-size) portions so you don't have to worry about stuffing yourself to the brim trying all the different types of food. 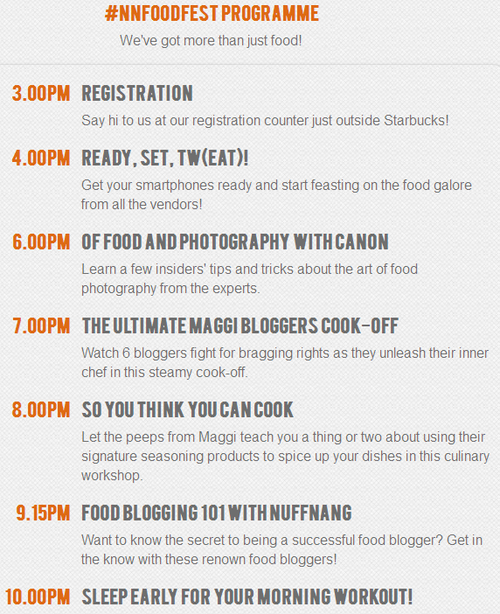 This is a great chance to mingle with fellow bloggers and maybe make some new friends along the way. So come and have a fun-filled day with us and experience the food galore! We'll see you at the #NNFoodFest!